Shullsburg, Wisconsin - a small town in the Southwest corner of Wisconsin. How/when did you become interested in science and/or medicine? My parents are rural veterinarians, and I grew up helping them care for their animal patients and listening to them discuss difficult cases. From a young age, I was sure I would pursue a career in medicine, but I struggled to decide whether I wanted to treat animals or humans. I have found pediatrics to be a rewarding field with exciting medical problems, vulnerable patients and appreciative caregivers. When did you join the University of Iowa faculty? How or why did you choose to join the faculty at the University of Iowa? My husband and I chose the University of Iowa because we found it to be an extremely collaborative and friendly environment. 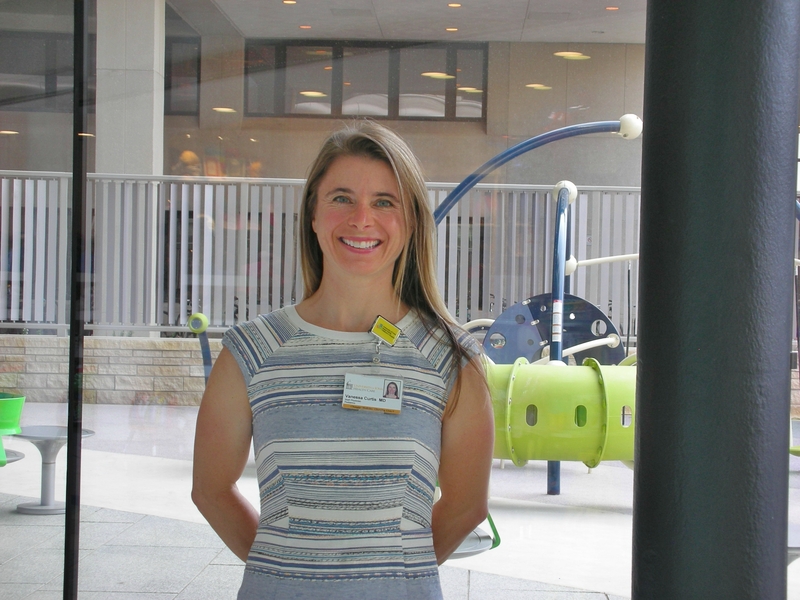 I had an opportunity to fulfill a need and my own professional interests by starting a multidisciplinary clinic for children with obesity and comorbidities. We love that the University of Iowa is a world-class tertiary care center with a small town feel ... and the Hawkeyes! Is there a teacher or mentor who helped shape your career? Dr. Todd Varness was my chief resident and later a pediatric endocrine colleague. He had boundless enthusiasm for both the science and the human aspects of medicine. It was easy to get caught up in his positive attitude which made residency seem like it wasn’t work, and he sparked my interest in pediatric endocrinology. Dr. David Allen was my fellowship director and is still a role model because of his outstanding clinical judgement, intellectual curiosity, and drive to be a great clinical educator. He could make the most mundane patient encounter into a valuable learning opportunity. Dr. Allen taught me to appreciate the subtleties in each patient encounter. How do you see your faculty role impacting medicine and/or science? While I truly do enjoy patient care, I hope that my am able to contribute to the education and professional development of many students, residents and fellows during my career. What is the biggest change you've experienced in your field since you were a student? The introduction of the electronic medical record has drastically changed communication between providers and between providers and their patients. What one piece of advice would you give to today's students? Being a good specialist starts with being a good generalist. In what ways are you engaged in professional activities outside the University (i.e. population based research, mentoring high school students, sharing your leadership/ expertise with organizations or causes, speaking engagement off campus, etc.)? I am active in my national professional organization (Pediatric Endocrine Society) as well as the Iowa chapter of American Association of Pediatrics. I enjoy speaking about pediatric obesity and the endocrine aspects of sports medicine at state and regional meetings. What are some of your outside (personal) interests? I am passionate about riding my bike. Bike racing provides a great outlet to relieve the stress of work and meet active friends.